The wild ride we’ve been on weather-wise continues to end the week. We started on Monday with sun and 80’s before crashing into the 40’s and 50’s with drizzle yesterday. Cool and drizzle was how we started today but look outside now and If you live in the state of Maine, you’ll most likely see a pleasant evening with 60’s, sun, and light breezes. Tomorrow continues the good stretch with sun and 70’s as high pressure noses in from the Maritimes. Another round of rain moves in to close out the month of May which will be associated with an upper level trough sucking in some Atlantic moisture. I’ll have more details on that rain threat tomorrow. A back-door cold front is sliding through tonight bringing some showers and storms with it. As we loose diurnal heating (heat from the sun), any activity should simmer down. The week ahead looks nice with high pressure in control through the weekend. Showers and storms threaten again Friday into Saturday. This summer will be a busy one and I cannot guarantee computer/internet availablity. Therefore, from now until Labor Day, I will not be posting a regular update in the 6 o’clock hour. I’ll do my best to post an update weekly and if there is some sort of severe weather, I’ll do my very best to update on here. Thanks and have a great summer! Today will feature the chance for some showers as a low pressure system hangs around our area. The greatest chance for this will be in the morning hours as the low sags south during the day taking the showers with it. Highs will be very cool for this time of year with highs in the upper 50’s inland to low 50’s at the coast. Bundle up! Usual bland was used with the addition of the NAM/ARW/HRRR for precip. 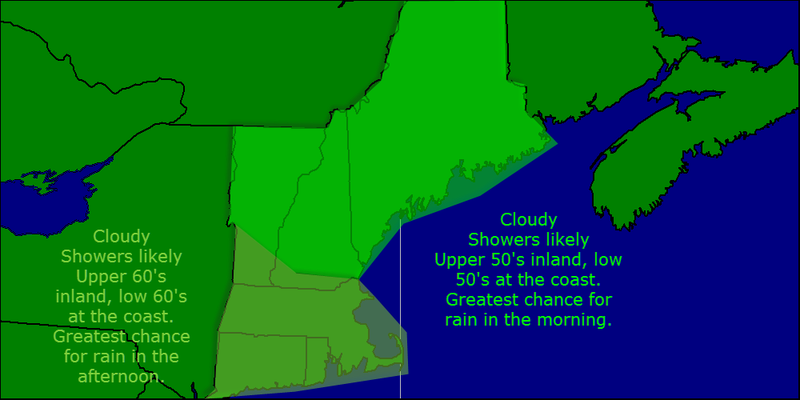 Today will feature showers for most of the area and steady rain for some. I cant rule out a rumble of thunder along with some heavy rain over western MA. High will be munch cooler today with temps running in the upper 50’s to low 60’s. High pressure over far northern Quebec is reaching into one lucky part of the area and will give them just the chance for a spotty shower. The winner is… the southern Maine coast! Used usual blend. Added HRRR/NAM/ARW for precip. Today will feature more of the same with partly to mostly cloudy skies and the slight chance for a shower inland. Highs will be in the 60’s at the coast and in the 70’s inland. The best chance for clouds and showers will be over western areas like VT, Western MA/CT. Used usual model blend. Added HRRR/NAM/ARW to confirm little to no precip today. Today will feature similar conditions to those of yesterday but with less rain. 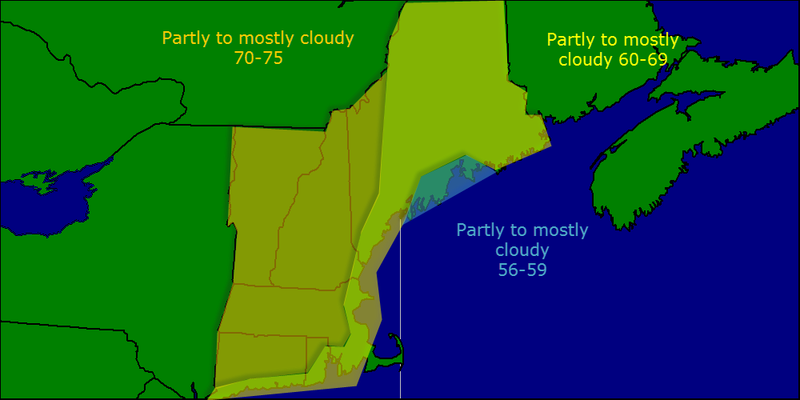 Clouds will be abundant over ME, SE NH, and Eastern MA while western New England sees more sun. Usual model blends. Added NAM/ARW/HRRR guidance for precip. Today will feature partly to mostly cloudy skies along with the chance for a popup shower or thunderstorm. 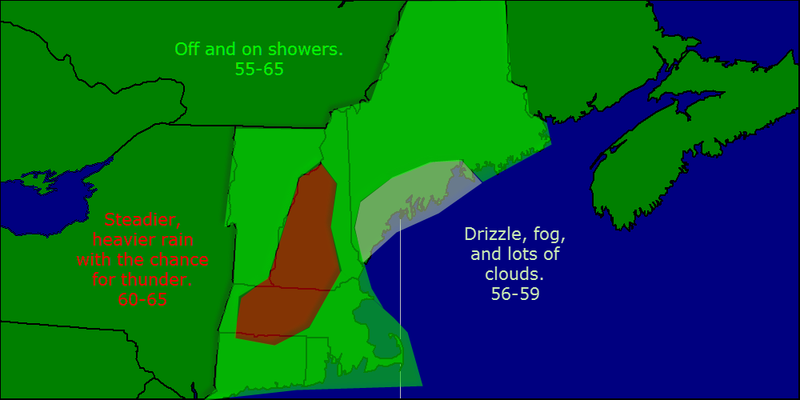 Any showers or thunderstorms have the potential to produce small hail. Highs today will top out in the 60’s for most. Used MAV/MET as always for temps. HRRR/NAM/GFS/HRRR was used for precip. NAM/GFS soundings used for hail and SAT/NAM/GFS was used for clouds.